The bustling atmosphere at Food 101 Bistro in South Hadley had all the signs of a busy Friday night: a full house, waiters covering several tables at once, delicious smells wafting from the kitchen. But this particular occasion was not a Friday night. 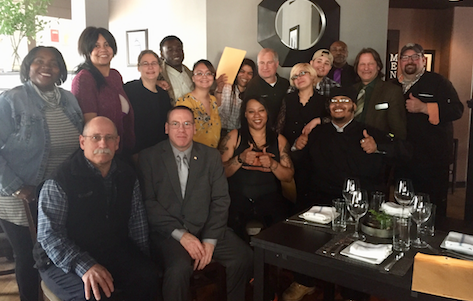 In fact, it was a graduation ceremony, the culmination of a 9-week training program where program participants learned all the ins and outs of the restaurant business, and that day their skills were on display. 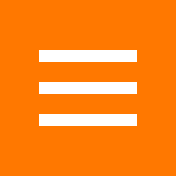 Carl was seated at the table next to mine. He was attending the graduation to support some family members, and he himself had graduated from the same program nearly a year before. Between one of the four gourmet courses served, he shared some of his story with me. A veteran, Carl had enjoyed culinary arts dating back to his time in high school. When he returned from service, he was looking for a job and the opportunity to refresh some of his high school skills. He found his solution in the Holyoke Community College Culinary Training Program funded by the Workforce Competitiveness Trust Fund. Several of the skills were familiar to Carl, but he also received training in a variety of areas that were new and essential to understand the food and hospitality industry including food and wine pairing, conflict resolution, ServSafe, OSHA 10, TIPS, and more. 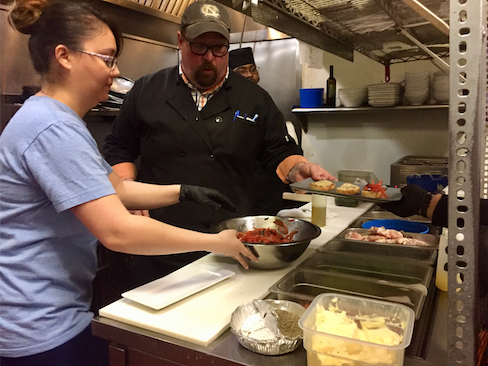 In addition to the significant amount of training and certifications, participants had the opportunity to work directly with Chef Alan, owner of Food 101 Bistro and their lead instructor. “When people start the program, no one really knows what they want to do,” the chef told me, “but throughout the program they get the feel and the energy of a real restaurant.” They receive training in both the “back of the house” or kitchen, and the front of the house which requires customer-service. When they’re not training at Food 101 Bistro, they’re putting in the rest of their 20 hours a week at a brand-new facility in Holyoke funded through a partnership with MGM and Holyoke Community College. The HCC MGM Culinary Arts Institute boasts brand new equipment, kitchens with enormous ovens, stoves, and everything you would find in a restaurant, in addition to classrooms, computer labs, and individual study spaces. Carl was part of the first cohort of participants that got to learn in the training facility. In addition to culinary skills, participants work on math and reading, and learn how to price a menu. They finish the program with every skill they need to be successful in a restaurant. 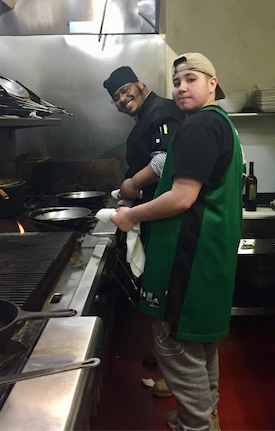 Since completing the program back in the fall of 2017 and re-entering the workforce, Carl has enrolled in Holyoke Community College and is on his way to earning his associates degree in Food Service Management. He is currently working as a chef in a restaurant and also signed on to work as a culinary arts lab tech and instructor with HCC. He taught classes to men and women in custody at Hampden County Jail that provided them with skills they can apply to a job in the food industry upon release. Carl finds teaching to be incredibly rewarding. “I want to be an instructor when I’m done with my degree. This has been a great stepping stone. It’s like an internship,” he said. Carl is one of 55 people to complete this program to date. Recent graduates are excited about the upcoming opening of the MGM casino which promises an increase in jobs in the very industry they’ve spent the past few months training for. Kermit Dunkelberg, Assistant Vice President of Adult Basic Education and Workforce Development, noted at the graduation, “Employers are hungry for talent. With the skills you have built here, you’re what they’re looking for.” The Executive Chef of MGM himself attended the graduation. As for me, I left the event feeling inspired, hopeful, and grateful that I’d saved room for dessert – the crème brûlée was the best I’ve ever had.